Are You Making Your Room Look Smaller? Bulky furniture. Sometimes we try to fit as much furniture as we can into a room to maximize the sitting space. While you may be providing more places to sit, you are actually minimizing the space in your room, making it look smaller. Consider adding several smaller pieces of furniture to open up your room. Inconsistent color scheme. Having too many colors in a room can make your space look smaller than it has to. A helpful tip is to have similar paint schemes in connecting hallways or rooms to create the look that the room doesn’t stop at the door. Clutter. Having too many small decorations and trinkets sitting around in a small room can cause your room to look cluttered. Instead of a lot of little decorations, consider adding a few, simple accents to your room that complement your paint scheme. So, How Do I Make My Room Look Larger? Stay neutral. Bright or dark colors can make your room appear even smaller than it is, so maximize the space by using light, neutral colors. Light colors can brighten your room and make the space appear more open. Concealed storage. Where should I store necessities in my room like remotes and blankets? Make necessary items disappear by adding furniture that doubles as storage or buy storage containers to keep items from cluttering the space. Replace your windows. 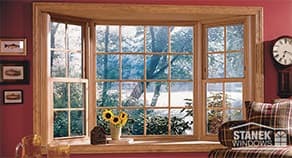 Old, dark windows can reduce the amount of light that enters your home and cause your space to appear smaller. There are certain replacement window styles that can open a room by giving the appearance of more space while allowing more light to filter in. Windows play an important role in the overall appearance of a room, especially when it comes to the size. One of the best ways to increase the space in your room is by adding a bow or bay window to your home. Not only do these windows add light to a dark room, but they also add depth and dimension! It’s surprising how choosing the right replacement window style for your home can add so much to your living space with just a few extra feet. Imagine creating an elegant focal point in your living room or designing a cozy reading nook with a great view of the outdoors. The large windows allow natural light to filter into your home, giving it a warm, homey feeling. 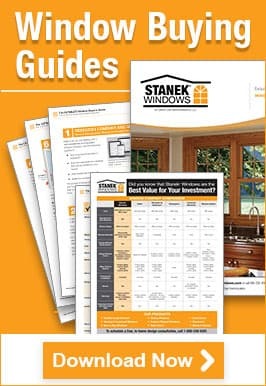 Unlike other window companies, Stanek Windows offers endless design options, including style, hardware, glass and more. Bow and bay windows can completely change the look of your room, so we believe they should be custom made to fit your home. Because bay and bow windows extend beyond your wall, not only do you need to consider the style of windows used to create your bay or bow, you’ll also need to consider the construction of the window seat itself. 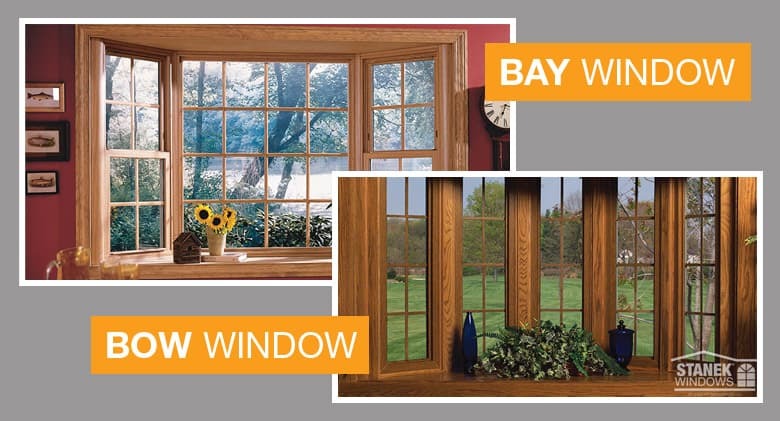 Stanek bay and bow windows are constructed using either 6-inch furniture grade oak casings or 3 ½-inch casings, depending on your needs. Bay windows project outward between 25°-45°, and typically contain three individual windows in the unit. The center window is designed to not open while the right and left windows open. Bow windows also project outward, between 10°-45°, but contain anywhere from three to six windows in the unit that all open. Our Ultra Elite collection of bow & bay windows offers custom options and unmatched beauty. To build your bay or bow window, choose either a casement or double-hung window style for ventilation, and then browse our endless custom options to create the perfect window for your room. 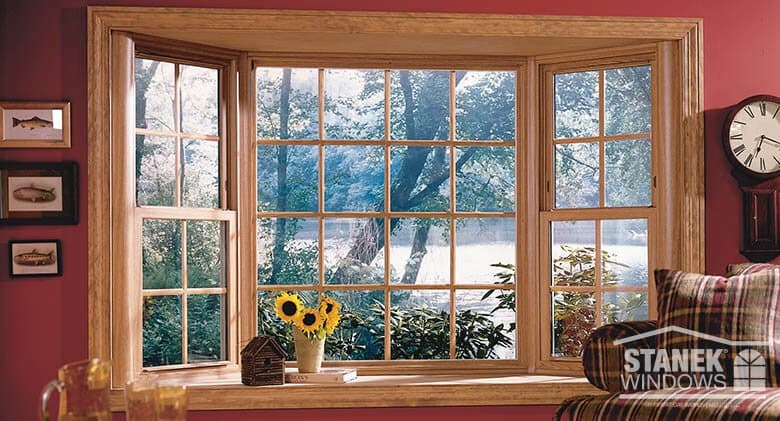 If you are ready to create the perfect bow or bay window for your space, give Stanek Windows a call at 1-800-230-8301 or schedule your free, in-home estimate today!